During the second world war, the introduction of rationing along with other social factors meant that money saving became and important part of daily life. In 2018, I know many of us could still benefit from this frugal mindset so I compiled a few tips from back in the day that I thought looked pretty handy. If you have any other 1940s money saving tips of your own, add them in the comments below this post! Old clothing that is worn beyond repair can be cut down into rags to use for household cleaning. Save the scraps left over at the end of a bar of soap and squeeze them together into a new bar by placing them inside a slightly damp washcloth and molding them into a ball. If you have a garden, try growing your own fruit and vegetables. If you don't have access to a garden or allotment, lots of herbs and some vegetables can be grown indoors on your windowsill. Making preserves such as jams and pickles helps make fresh produce last as long as possible. This is especially useful if you have more fruit or veg from your garden than you can use. Use talc or cornflour to absorb and remove grease stains from clothing. Best when the stains are treated immediately. Try foraging for hedgerow fruits to use in puddings and preserves. Chips in kitchen glassware can be fixed by rubbing them down with a fine sandpaper. If a recipe calls for a few drops of lemon juice, prick the lemon with a fork and squeeze out the required amount. This ensures that the lemon will not dry out and can be used again. To save a dry cake, wrap it in a damp tea cloth and place it in a warm oven until the cloth is dry. Alternatively, place it in an airtight container with several slices of apple. We may not still be under wartime rationing but you can still save money (and help the planet) by having a more shallow bath. White vinegar is a great cheap all-purpose cleaner. Use it for washing windows, cleaning counter tops, shining brass, and descaling kettles, irons and showerheads as well as many other uses. Unpick old hand knitted garments and carefully wash and dry the wool to use for knitting other items. Set up your own clothing exchange like those set up by the Women's Voluntary Service so you can swap clothes with your friends. Alternatively, use Facebook to find a clothing swap group to exchange clothing with others online. Learn how to make small repairs to your clothing such as darning holes, reattaching buttons and fixing hems. Make your own accessories to add interest to your outfits and help make them look different. Try a bright floral brooch or a stylish tilt hat. Inspired by refashioning instructions from Depression era and World War Two magazines, turn cheap clothing from thrift stores into new items for your wardrobe. Upcycling a men's shirt into a women's blouse is a good place to start. Use a terry-cloth towel to "dry-clean" and refresh hair in between washes. Simply rub the towel vigorously over unstyled hair as an alternative to dry shampoo. If you're brave, try using soap or a sugar-water or water & vinegar solution to set your curls. These are all authentic (and frugal) methods, but might be a bit much for modern-day vintage enthusiasts. For a very natural and inexpensive makeup look, dab a bit of petroleum jelly into the eyelids instead of eyeshadow. The last remaining bits of a lipstick can be used up by digging them out with a lip brush or tooth pick. Happy New Year everyone! I hope you've all been enjoying the holidays. I've been doing a lot of travelling, including today, but I've been able to spend some time with family and enjoy lots of great home comforts. 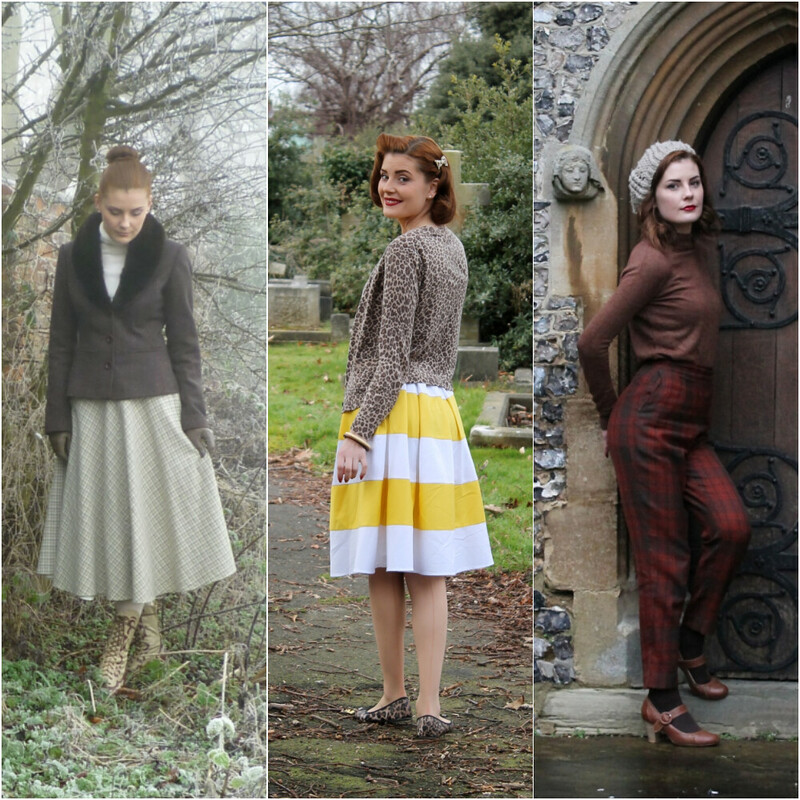 To round off 2017, here is a brief look at some of my favourite outfits that have appeared on the blog throughout the year. All the outfit details can be found in the original posts which you can find just by clicking the links under each post. If you'd like to see similar posts from previous years, you can do so here: 2013, 2014, 2015, 2016. 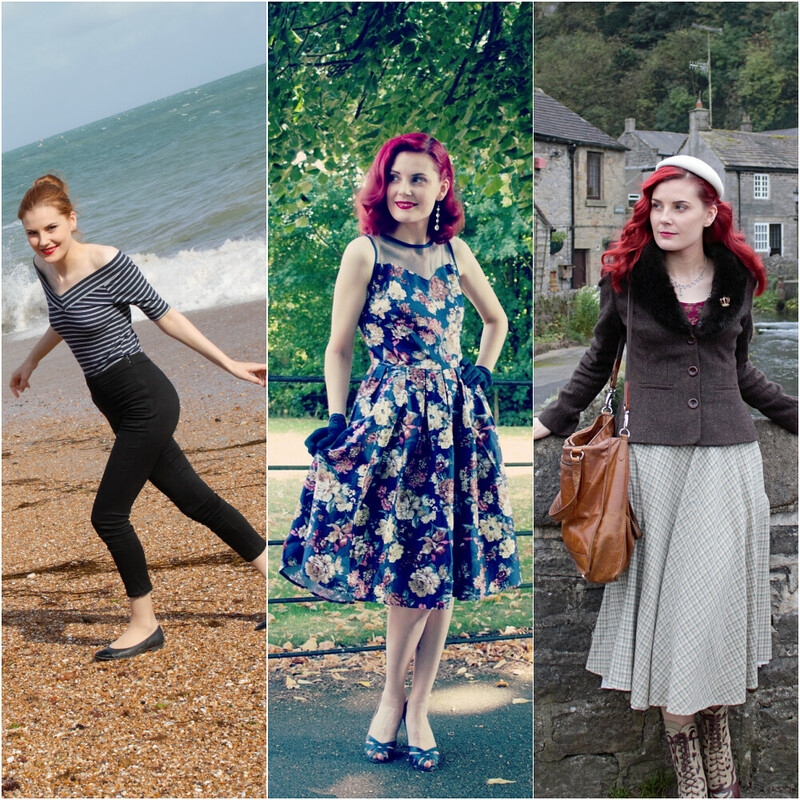 Apart from the missing month of August (when I was away a lot and didn't fit in a single outfit post), I'm pretty happy with this year's selection of outfits. I really enjoyed my ginger hair, and I might go back to it at some point soon. The bright red was fun, but it's a pain to upkeep, and I did think the ginger suited me particularly well. Anyway, here's to 2018 - perhaps I will finally develop a somewhat cohesive sense of style!